EDM serves as an alternative to metal cutting and removes metal via burning or erosion. Graphite is a vital component to EDM because using graphite as a conductive material resulting in longer-lasting EDM electrodes, and removes metal more quickly. The graphite electrodes are used to tool the desired shape and carry electric current in the EDM process. Graphite is easy to machine, exhibits great temperature resistance without burning, chemically changing or melting, and is relatively inexpensive. It may also be redressed multiple times, making them a cost effective choice for electrode material. As an alternative to copper, machined graphite can be used wherever electrical discharge machines are used, including the food, beverage, automotive, metal stamping and extruding, defense, electronics, aerospace and medical industries. One of the only drawbacks to EDM graphite is the mess it creates while machining, due to the nature of its particles, machining graphite generates a large amount of dust. This can result in unpleasant working conditions or in potential contamination of products and equipment if not carefully maintained. Modern electric discharge machines are often equipped with negative pressure shrouds, which remove almost all the dust. 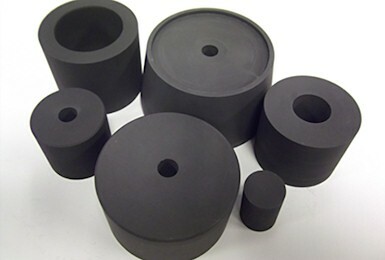 There are 5 main measured physical properties of EDM graphite. The first is particle size. The graphite powder that is used to make EDM tools has varying grades of fineness. Smaller particles result in a smoother surface finish, while large particles offer a higher metal removal rate. Next, flexural strength is measured. Tighter bonds between particles result in greater strength, which means good machinability and reduced erosion during the discharge phase. The apparent density of graphite measures how much carbon there is in terms of volume; the higher the density, the lower the wear rate. Hardness is measured in shores, and good, strong EDM graphite is between 60 and 80 shore, and exhibits no cracking or chipping during machining. Finally, electrical resistance is measured. Lower measurements usually mean overheating is unlikely. The different sizes of particles are used to classify graphite, the most advanced and fine type of which is called angstrofine, and it is used when fine detail and a smooth finish is required. It has particles smaller than 1 micron. Next, ultrafine particles are between 1 and 5 microns, and are the most common. Superfine particles are between 6 and 10 microns, and are used for roughing in cavities with larger detail, while fine graphite, with particles between 11 and 20 microns, is strictly used for roughing large cavities. It is important to choose the correct EDM graphite for the specific application as some types are more suitable than others, depending on particle and product size, desired precision of results etc. EDM Graphite EDM graphite is used in electric discharge machining because of its electrical conductivity properties and its temperature resistance.